Since the quilt for my first niece took way longer than expected and I end up giving it to her for Christmas 9mths after her birth, I've made it tradition. Each of my nieces and nephews have received an Auntie-Kelly-made quilt for their first Christmas. This Christmas just gone was Zachary's first. So here's the quilt I made for him. 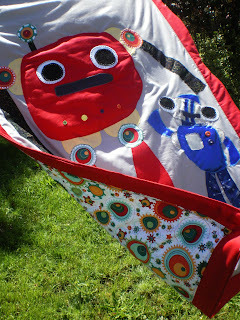 I found the fabric I used for the back side and loved the cogs. I decided I had to do robots with his theme colour being red. I played around with some sketches until I came up with this design and then with the border sewn on I laid out newspaper and did the sketch to the size I needed it. Then I sorted through my fabric stash and cut out the appropriate pieces. I cut out some cogs for the big robot to tie it in with the backing. I hand stitched the eyes for a different effect and also stitched on button buttons for texture. I stuffed it with sheet polyester stuff that I actually split in half to make it thinner. It insulates really well so the quilt will keep him very cosy in the winter. I stitched it all up and happily gave the robot friends to Zachary. He happily recieved it. He seemed particularly cheery after opening this present. I'm not sure how much that means this not quite one year old likes the actual present but it made me feel good. I like the robots. And I love Zachary. What a good tradition! Lucky I didn't have triplets ;) He's had it on his cot ever since. 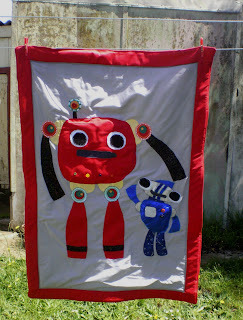 Love, love, love the robot quilt, great job you did. What a gorgeous quilt! I love the robots. Very clever to pick it out from the backing. Oh, there were other robot prints there too but I liked the cogs best.